Place 6 oz of chocolate candy melts in a small microwave-safe bowl, and microwave in 30-second increments, stirring after each, until the candy is completely melted. Transfer the melted chocolate to a prepared piping bag that has been fitted with the #2 icing tip. Draw eyes and mouths on all of the marshmallow snowmen and allow to cool. Repeat the process using the orange candy melts, and gently squeeze the orange candy from the bag to form the carrot noses. Allow the melted candy to cool and set. Use the Wilton icing to create “earmuffs” for your marshmallow snowman – squeeze a round dollop on each side of the snowman’s head and then make a headband across the top to attach the earmuffs. 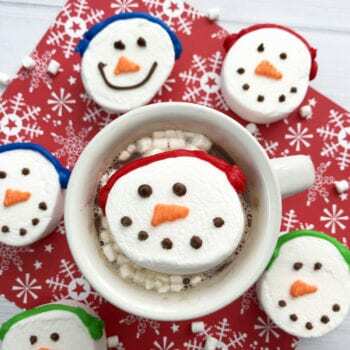 Top your favorite mug of steaming hot chocolate with an adorable snowman marshmallow for a delicious winter treat!